AUTISM - FREE Halloween Thank You Cards for Trick-or-Treating! 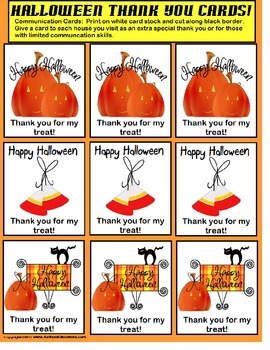 These FREE "Thank You" Halloween cards are perfect for non-verbal or those with limited communication skills. Have your child/student give one of these festive cards to each home they visit. It will make a lasting impression on all! Happy Halloween and enjoy!